Seems to be a lot of interest in light wind foiling. Tested the Infinity 84cm (2066 sq cm) in ENE fluky 8-12 knots with occasional gusts to 18 knots to keep things interesting. Not normally exciting windsurfing conditions but I had a blast. 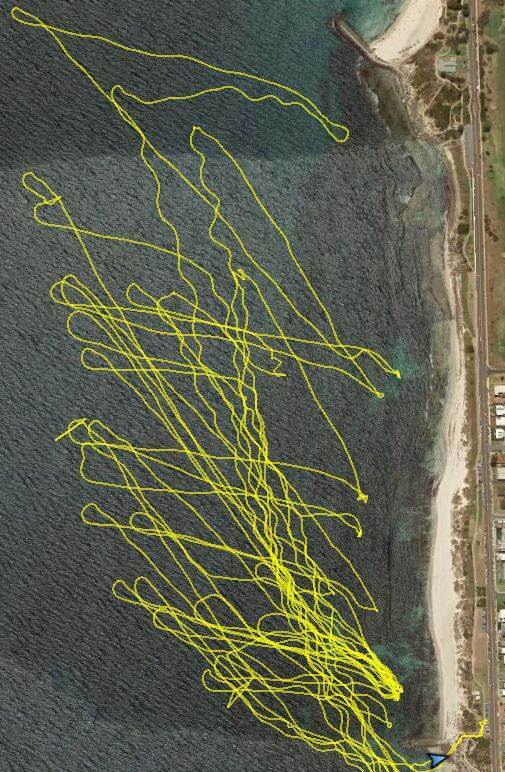 Reasonably fast - got 18 knots today without pushing it. I reckon it will do about 20 with a smaller sail and more wind. It's easy to softly pump the wing with your feet (like a SUP foiler), which helps catch and stay on the tiny swells when down-winding with no wind in the sail. The lift generated by the feet-pumping prevents the weight of the big rig depressing the nose of the board. Crazy fun - I can see why SUP foil down-winders get so stoked. The COE of the 84 is about the same as the 76 in B fuselage position, changing to C would probably generate more lift as would using the bigger rear wing. I'm happy to stay with B and one size rear wing to make swapping wings quicker. The Simmer Enduro 5 batten sail is ideal - light, powerful and has a nice springy action that helps pump on to the foil. I don't think I'd use over 6.5m - I reckon bigger heavier sails would probably compromise the carving ability of the foil and I doubt would drop the foiling threshold much beneath 8 knots. foiled tonight in super flukey 8-18+ mph with a 5.0 (JP 135) and it fly's through holes like nothing else and I'm 92 kilos, have yet to foil anything else like it. Keep your reviews/ videos coming on this guys. The new slingshot Wings particularly the 76 and 84 are inspiring a lot of people including myself to switch there current foil brand and go to slingshot. Coreas, I can't remember but were you using the 2018 foil with the new wings?From my knowledge the 2018 and 2019 fuse are the same...(you can use the 76 & 84 on it). The mast is shorter on the 2019 setup.Or can you get the 90cm too? Yes Fuselage and mast are identical. 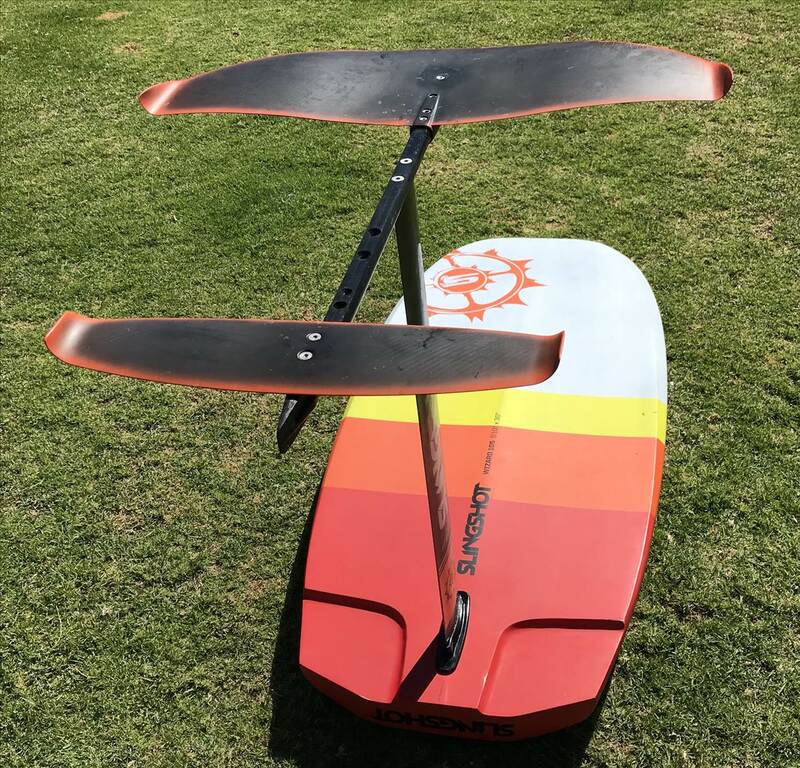 When you buy a SS 2019 it comes with a 76 infinity wing and with a 60cm mast, you buy the 90cm separate. Its all modular! I have the 84, 76 and 68 and use them all on a 90 mast, standard fuselage and 42 rear wing, you can get a 48 rear wing (which I also have) but I haven't really tested that out yet... Our last 3 weeks has been awful weather. Snippet from last night. It was blowing when I rigged up but dropped rapidly. Other Foiler's you see are on 6.5 or 7.0. I was on a 5.0! Pretty good testament for the infinity 84, I think you'd agree. That wind looks really light and you keep flying effortlessly, except for the few pumps at the end but you still keep flying. 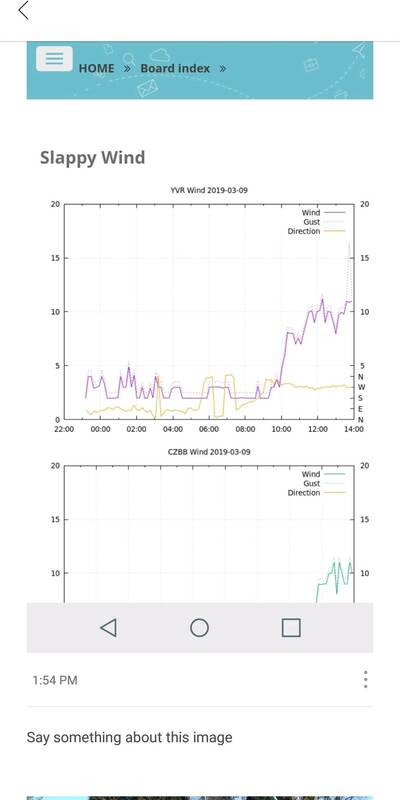 In that kind of wind I would be struggling to keep foiling and get foiling on my formula board, np AL foil, 7.5m and not to mention I'm 25 kgs lighter! CoreAS - wind looks super-light, nice going with a 5m! Azymuth. My fellow wind Foiler's didn't think it was possible (especially me being a heavyweight, ha) and we're expecting me to rig up. All I need is a ripple to pump onto the 84 and it keeps going. The low end torque is like nothing else I've foiled. The 76 is definitely quicker but the 84 ticks over like a Diesel engine, great stuff. I had a magic afternoon with a bagged out '99 Sailworks Retro 6.5 sail and Infinity 84cm wing. I was out from 1-1:45pm. 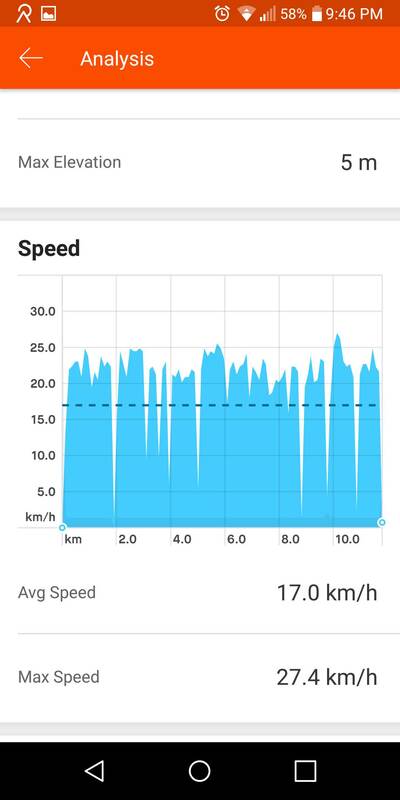 Wind graph is in knots, my speeds are in km/h. This foil is so locked in and glides so incredibly well. I am about the get your set-up but I am not sure the size of your back wing. Apparently, there are small and large wings. I will use this set-up on my old Starboard F-type 158 lt or CarveIQ 141 lt (83.5 cm wide). Hi Salkan - I used the regular smaller back wing with the Infinity 84 wing - it works great. I haven't used the larger back wing, but I guess it would make the foil even more stable in flight and perhaps generate a fraction more lift - at the cost of a little more drag, so perhaps a knot or two slower. I think the SUP foilers go for the larger back wing. So, if you think you might ultimately get smaller front wings in addition to the 84, I would just get the smaller back wing. If you're 100kg+ or a SUP'er and will only get the 84, I would get the larger back wing. 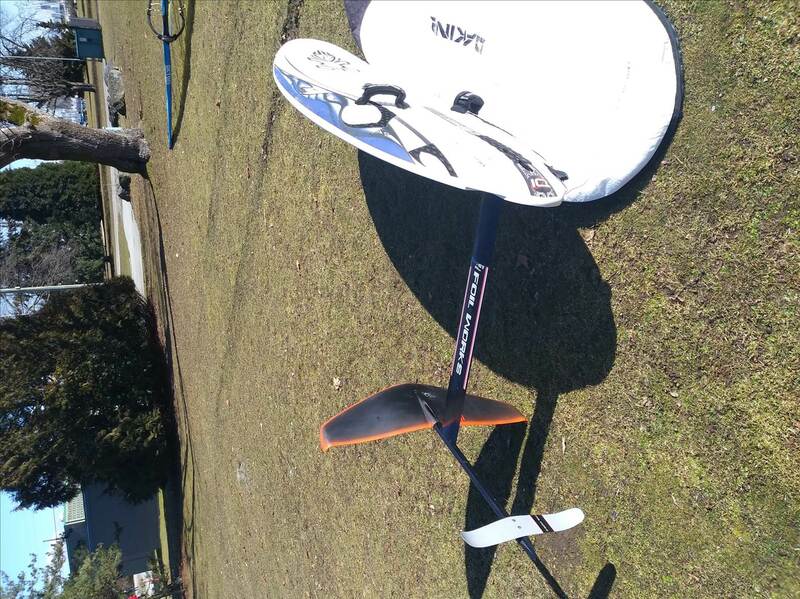 Had a good test of the Slingshot Infinity 84 wing - it carves amazingly well downwind, better than expected. It has so much lift that it flies back upwind easily even in 10 knots of breeze. It does need a reasonable amount of back foot pressure in B fuselage position - next time I'll try it in C with the bigger 48cm rear wing. Tested the Infinity 84 wing in C fuselage position (max lift) with the large 48 cm rear wing. Super easy to ride - beginners will love it. 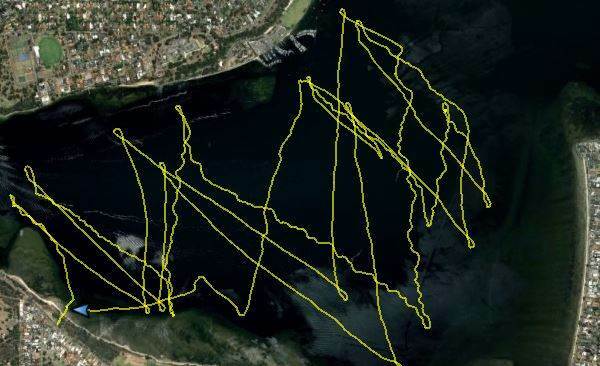 Heaps of fun carving downwind - you can slow right down to SUP foiling speeds to play on the swells. Quite a different feeling to being more powered up and faster with the smaller wings. Nice lines and great summary Azymuth. My experience has been exactly the same with this foil and I'm running the original fwind1 rear wing. This in my opinion is a great foil option for beginners, it doesn't slam down hard during breaches. Downwind is crazy fun, the only other time I've gone straight downwind for long periods like this was when I used to longboard as a kid. I'm now starting to think of my rig as a SUP with a sail on it, the sail is the thing I use to get way upwind so I can SUP foil downwind at the end of the session. Cheers! is that an extra screw that you have put in the front wing? I read on a post in SUP foiling that you can drill a hole in the wing to line up with the threaded hole near the end in the fuselage and I wondered if you had done that and whether there was any noticeable benefit if you had? Downwind is crazy fun, the only other time I've gone straight downwind for long periods like this was when I used to longboard as a kid. 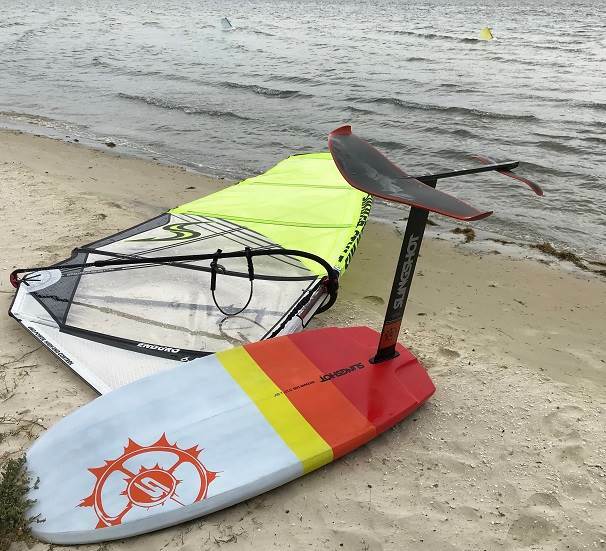 I'm now starting to think of my rig as a SUP with a sail on it, the sail is the thing I use to get way upwind so I can SUP foil downwind at the end of the session. Cheers! That's what we (the Dutchies Downwinders ) are finding. Yes, I drilled an extra hole in the wing - the hole in the fuse is already there. Having an extra screw means I don't have to tighten the first screw quite as hard to keep the wing tight. It's probably unnecessary - when the wing used to rock a little, I can't say I noticed it in ocean chop/swells. Do you have ank problem with mast cap (we have "eaten" brasss inserts on three of them)? Did you have to waterproof the drilled hole? Would be curious to know the long term effects of the extra hole vs not. Has anyone else found these wings to rock a little. Is this just a inf 84 problem?? I haven't experienced any rocking whatsoever with mine, I've only had five sessions on it so far. I think a lot of the drilling the extra hole came from SUP foiling were guys were running the mast in the A position and it seemed to wobble and create slop in the wing slot. Drilling the extra hole still is a good idea in my mind but you only get one chance to get it right, someone needs to come up with a template to lay on the wing so it becomes a sure thing.Oh and while they are at it make one for the 76. I bought the 84 cm wing and 48 cm stabiliser. I fitted the stabiliser on top of the fuselage using the hover glide shim that came with my infinity 76 and 42 cm stabiliser. Board planed very quickly but the nose was being forced down. I first tried the 84cm wing on B and I could not get it off the water, flipped to C and was golden. The 84cm wing has a short neck and benefits from flipping the fuse, whereas I prefer the 76cm in position B. Some of this depends on how aft the foil mast attachment (finbox) point is relative to your footstraps, though. My mate said that the sup and windfoil stabilizer shim is exactly the same but I have not confirmed this. I am now keen to try the wing in position "C"
Good news if I do not have to buy another shim. I will also be trying the foil in a prone foil board - it seems like it has to be in position "A" for that. 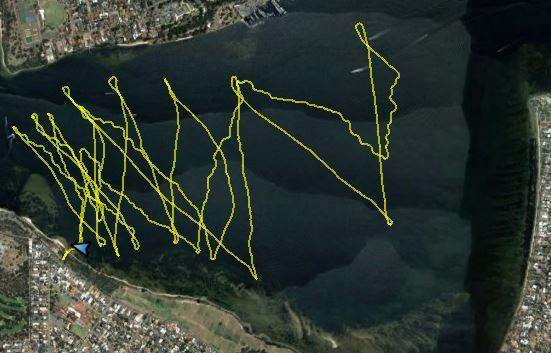 Off topic question - what GPS device are you guys using to collect the track data? Mahalo in advance. Let us know how the prone foiling goes. I tried sup foiling a few times but am just not a good enough "sup-er" so I let it go. Reporting back after trying position "C" on the fuselage with the 84 cm wing and 48 cm stabiliser. Went out and was not enough wind to pump onto the foil. Just keen to try. Came in and started to pack up and a bit of wind came in. Blowing offshore so gusty maybe 10 knots. Could get planing in both straps a bit of pressure on the back foot and up she came. Very steady and predictable. Still had to keep weight on back foot. Could lock in fly quite comfortably. Can see why it would be good for learning. I would like more of a balanced feet feel between front and back feet as there was no way I could hold it up on the foil to gybe. I will try moving the footstraps all the way back. I am using a JP super light wind so longer nose and weight than a dedicated foil board. Compared to the affinity 76 cm wing the centre of the wing is a fair way back. I had the mast at the back of the track. will also try the foil on a prone board over Easter. 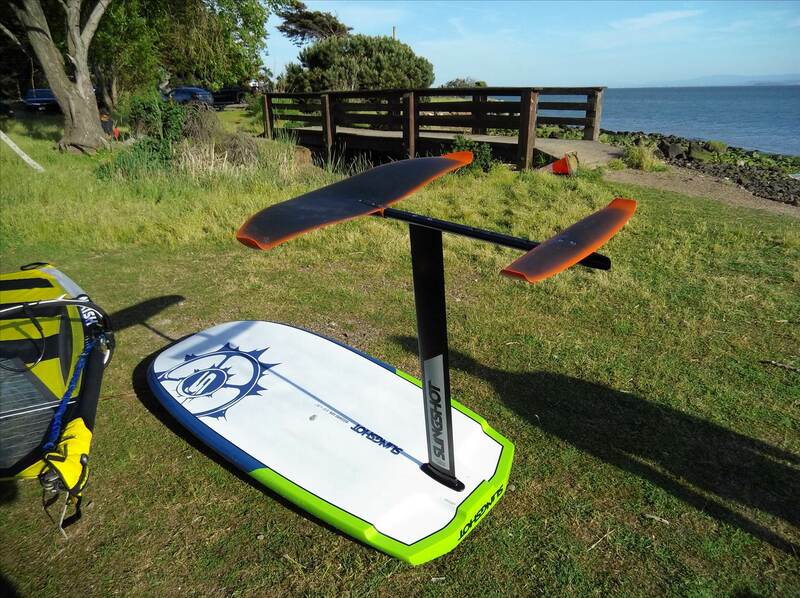 I tried the 84 wing with the 48 SUP/surf stabilizer and did not like it at all. Seemed slower than regular stabilizer and needed heaps of back foot pressure to keep it flying. Also if I tried to angle upwind I would get a spinning out feeling. Why are the tips on that stab turned differently? Any idea? For some reason on the sup/surf set up they go they are on the opposite side.